The east face of peak “Berlin”–the “wall” is technically around to the northwest. We skied the large gully furthest left–pretty fun! More low-visibility touring, but pretty good snow (for us impoverished Colorado folks) on the fifth day of our ski-mountaineering course. You might ask what “ski mountaineering” is, so let’s geek out for a sec and make sure everybody’s up to speed on the latest affluent-white-person sport. Ski mountaineering implies climbing peaks, traveling on glaciers, and generally “going bigger” than just “backcountry skiing” or “ski touring.” It’s all shades of grey, but within the context of the American Mountain Guides Association (AMGA), the “ski-mountaineering” course builds upon the entry-level “ski-guide” course by introducing glaciated terrain and bigger objectives, with respect to both altitude and commitment. The AMGA used to offer an exam after the first-level course, but it’s gradually phased out and today one must continue to the final exam–ouch! 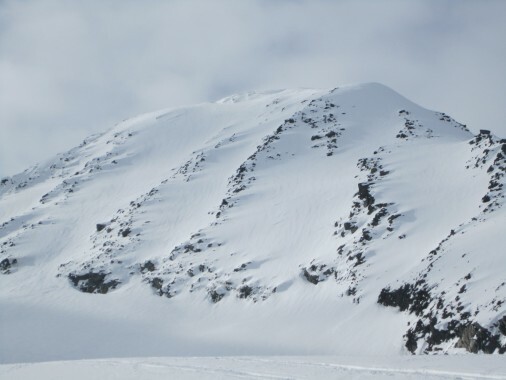 Valdez is a great place for a ski course because there’s big terrain right off the Thompson Pass road, with climbs up to 5,000 feet just off the tarmac. And yes, brothers and sisters, if there are climbs that big…there are descents, too. Open a map and suddenly one recognizes there’s a gazillion more peaks to ski further afield, in the Chugach Range, where we are, and over in the Wrangells, where our largest national park (Wrangell-St. Elias) sits. Book a few days of heli skiing up here and you’ll wreck your taste buds for good: Berthoud Pass just won’t seem like enough ever again. Today we toured to the south ridge of the “Berlin Wall,” climbed the ridge, and then dropped down one of the three main gulleys on the east/northeast face. I pulled the “short-roping” section of the ridge, which turned out to be pretty cruiser–which means, no rope really needed, but it was good to get some feedback from Vince Anderson, our course leader. A great descent, with a bit of walking on the highway, and our day was wrapped by 1:30. Showered, pack drying, blogging now…tour plans, dinner, a guides meeting, and bed to follow. Pics below. Ciao! Drew Daly, about to down-guide our chosen line for the day. 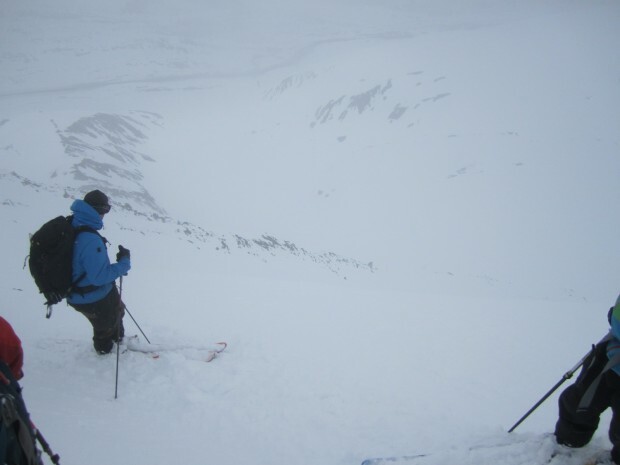 Tough visibility, but he cut up the slope enough for us–his “clients”–to enjoy the turns. Good job, brudda!